Thank you for your interest in participating in the CHLA Core Pilot Program. At CHLA, our Core Pilot Program exists to supply funding support for investigators to acquire preliminary data to provide a competitive edge for securing extramural grant funding. This program is one of a number of institutional investments to grow the research portfolio of the CHLA research enterprise. Below, please find the CHLA Core Pilot Program Toolkit and the simple steps to get started on applying for Core Pilot Program funding. The information provided is designed to help plan a successful pilot project. 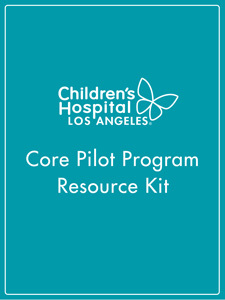 Step 1: Review our CHLA Core Pilot Program Resource Toolkit, hyperlinked below, which contains eligibility information, application requirements, pilot project process and list of participating Core facilities. Step 2: Meet with the respective Core Director to determine the feasibility of the project idea and the timeline. Step 3: If Core Director agrees in the project’s feasibility, complete the CHLA Core Pilot Program application. Please allow 5-7 working days after submitting your application to receive a response from the Core Director and Research Operations.